Our Kids Cookie Making Kit makes delicious sugar cookies in six shapes -- heart, star, flower, butterfly, dinosaur and car. Spread the baked cookies with icing and top with sprinkles. So fun and so fancy! Kid’s love creating in the kitchen—it is both educational and fun. Baking kit includes a adult high quality pan, first quality ingredients and wonderful accessories that kids can use to give them years of baking joy. Made in USA. 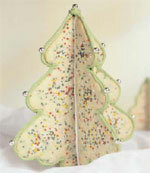 Delight family and friends with festive cookies to nibble, give as gifts, or hang from the tree. Set includes 10 shapes in a gift tin, ranging from a 2 1/2" star to a 4 1/4" Santa. Recipes included. 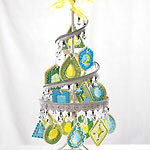 Create a contemporary tabletop cookie tree with these geometric-shape cookie cutters. Instructions provided. 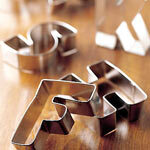 26 metal shapes for baking or crafts. Take a stroll through this fanciful holiday forest.